So things started to sink in a bit more recently. Like I had thought, buying my plane ticket really helped. It took some time to figure out exactly what Peter and I wanted to do. Since our original plan was to get there the first day the dorms opened. But the tickets kept going up and down in price, and finally went up to an amount that we both agreed we didn’t want to pay. So after talking we wondered if it would be cheaper to get there a few days earlier. Since we would leave on a Tuesday instead of Friday. It ended up being a lot cheaper. Even after adding the price of the hostel for three nights it ended up being a couple hundred less than what we were originally going to pay. 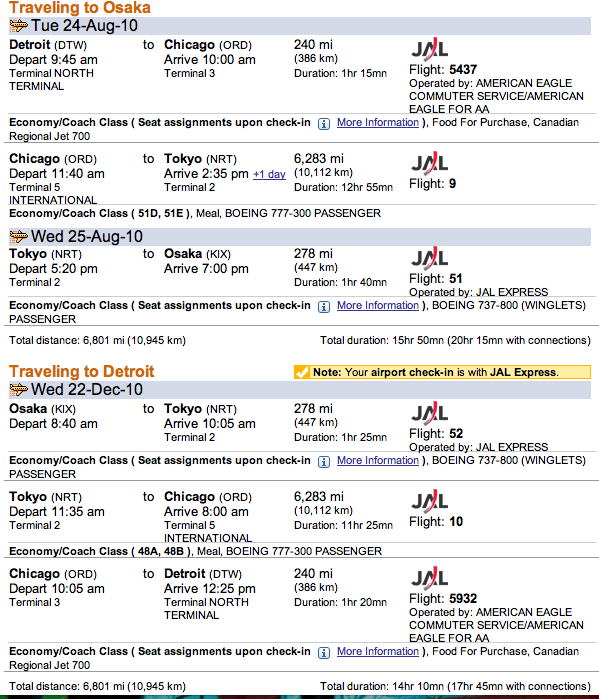 So now, we get to pay less and we get to explore Osaka for a few days before we have to check in the dorms. I’m pretty excited and I know Peter is as well. The airline we are flying is a much better one then the other one we almost took. Having my luggage lost for a few days and having stuff stolen was enough to convince me to be really cautious about booking with them again. Anyway, here are my flight details!